October’s market stats slowed down in some ways but picked up in others. Sale prices went down a small amount, but homes overall are selling significantly quicker. This faster pace of property transactions reflects the difference between pre and post-recovery from Hurricane Irma. It took a few months for the market to show signs of bouncing back, but since then, demand for real estate in the Key West market has continued upward. The drops in stats such as sale prices and number of units sold is minimal enough to not warrant concern. Comparing data from a year ago, list prices are lower, with the average list price for October 2018 at $877,892 compared to $901,027 a year ago. This is a 2.57 percent decrease in year-to-year data. Median list prices for the month came in at $619,000 for the second month in a row, up by 8.79 percent from $569,000 in October 2017. Year-to-date listing prices continue to show a rise as well, with a median of $684,500, an 8.82 percent increase. Both average and median sale prices for the month went down an incremental amount. Average sale prices for October 2018 came in at $730,341 compared to $810,258 in October 2017, down by 9.86 percent. Median sale prices came in closer to last year, being reported at $594,000 compared to $617,000 a year ago, down by 3.73 percent. The key take-away from this change is to note how quickly we recovered from the devastation of Hurricane Irma. This is reflected in the data from the month prior. Recall in my last report that our Average and Median sale prices went up dramatically for the month; over 100 percent for average sale prices and almost 50 percent for median sales. To see a shift back to less than a 10 percent difference in year-to-year data highlights the recovery of sales in a quick period of time in 2017, and an ongoing, solid market in the months since. October’s sales report shows 43 properties sold in Key West compared to 44 transactions completed in October 2017, a 2.3 percent decrease which also reflects how quickly our market bounced back a year ago. Year-to-date sold listings show Key West is in a steady climb up, with 509 listings sold so far, compared to 489 last year for the same period, a 4.1 increase. There were 95 listings added to the market last month, with a total of 470 active listings for the market. Of special note, 141 listings are priced at or below $99,999, continuing the potential for great starter homes for first-time buyers, as well as for investors looking to get into the Key West market with a good deal on property. The majority of active listings range between $350,000 to $1.29 million; there’s property for all budgets and lifestyles here in the Keys. 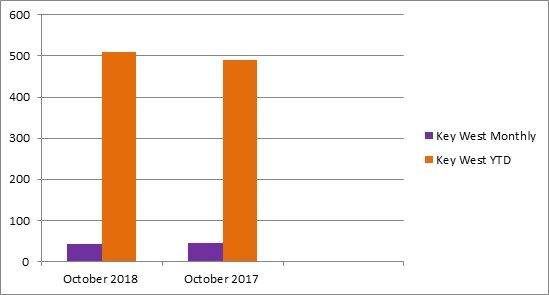 Days on the market were dramatically fewer in October compared to the year prior, yet another direct impact from Hurricane Irma. The average days on the market for listings sold last month was 146 compared to 178 days a year ago, Homes are selling 17.98 percent faster on average. 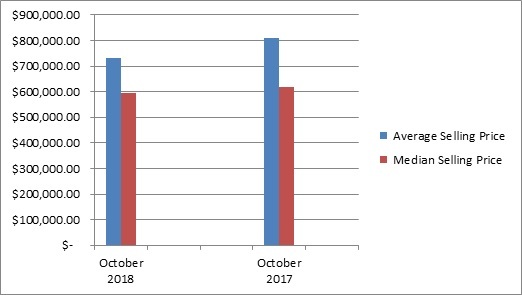 Median days on the market went down to 81 days compared to 116 in October 2017, a 30.17 difference. The rate at which Key West properties are selling reflects the ongoing demand for homes in the area; Key West is where people want to live, and where homebuyers are finding properties they want. Other markets will continue to see large upswings and downtimes based on the weather, but in Key West, we avoid many of those restrictions. Our climate is steady and will continue to draw buyers to our area year-round. Whether you are a tourist or looking to make a permanent change to the Keys, there are many reasons to move to our beautiful area. If you would like more information on the real estate in this amazing area, contact me, Jimmy Lane, at Key West Real Estate: 305-766-0585.